WIth the second baby there are a lot of things we are re-using, but some things we had to double-up on, like a new monitor. Creature of habit that I am, at first I wanted one just like the old one, because it seemed to work pretty well at long distances and it operated in the 900 MHz band (between the cordless phones and WiFi the 2.4 GHz band was getting pretty crowded). But the old one wasn't available any more, so I had to settle on the new model, and I'm really glad I did. There are a couple of enhancements to it, first and foremost being the fact that the receivers are rechargeable. With all the AAAs I was feeding into the old one, this new feature is great. Plus, it's got an LED screen telling how much battery life is left, the signal strength and what channel you're on. It will even beep at you if it isn't receiving any signal at all, or if the battery is dying. It doesn't rumble like the old one did, but I'll gladly trade that in for a battery that recharges. It's not like I've got a lawn to mow while the baby is sleeping. 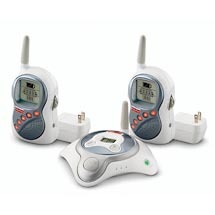 Get the Fisher Price "Private Connection" Monitor with Dual Receivers (one for upstairs, one for down) for $38.72 from Amazon via the Modern Day Dad Store. What good is that baby monitor anyway? I should probably preface this by disclosing that, due to spendingmuch of my pre dad-life in rock bands, I have a pretty average case of tinnitus (constant ringing in my ears) that I’ve learned to live with. My hearing is OK – it’s a little tough to understand people in crowds and it’s generally known I keep the television up too loud – but the only truly annoying side effect is that certain noises, particularly high pitched noises, sound particularly loud to me. Or maybe it’s just that I notice them more. Ninjas come in through her window at night and steal her. This would be a tough one, as ninjas are notoriously stealthy and would likely be hard to hear on a baby monitor, but a brief scream from my Madame heard over the monitor might wake me. She decides she’s had enough sleep, stands up in her crib and vaults herself over the side, landing on the floor. This might be one I’ll have to worry about in a year or so, but at five months I’m pretty confident this won’t happen, though she is advanced. Any electronic toy or device in her room spontaneously turns on and starts making a racket. I don’t see this one happening as I don’t believe in ghosts (I’m thinking about that creepy clown in Poltergeist here), but I guess you never know. She starts talking in the middle of the night. Now this would be something to blog about. I’m lying in bed trying not to hear the silence over the monitor and my five-month-old says something like “Love you daddy,” or “Fire truck banana robot.” If that happened I sure would be glad I had that monitor on.